Lands End Baja California is the most southern tip of the Peninsula Baja California, Mexico, that separates the Sea of Cortez (aka The Gulf of California) from the Pacific Ocean. 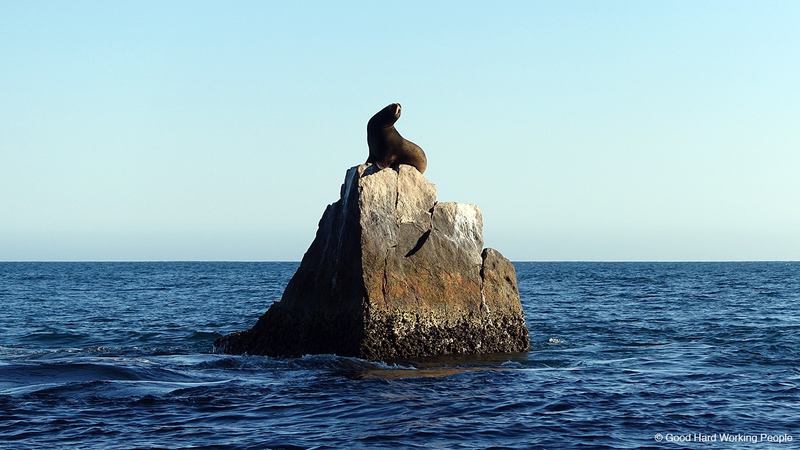 Lands End Baja California is a stretch of granite rocks, also called The Friars, in Cabo San Lucas, Mexico. The most famous rock formation is El Arco or The Arch of Cabo San Lucas. 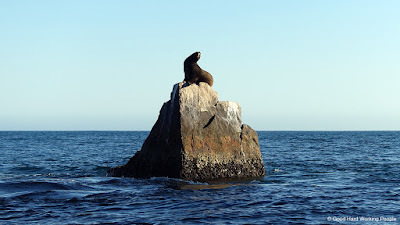 The most southern part of Lands End Baja California is a smaller rock jutting out of the sea that is often, as in this video, graced by a sea lion. Another attraction of Lands End are the two beaches that can only be reached by boat, mainly glass-bottom water taxis. Lovers' Beach is where the water taxi will drop you off and pick you back up. It's also where you can swim and snorkel and look back at Cabo San Lucas and the cruise ships and yachts. Divorce Beach is much larger and has one wicked undertow and crashing waves coming from the Pacific Ocean. Lands End used to be frequented by pirates like Sir Frances Drake and Thomas Cavendish. There are even still some pirate caves in the rocks that sit directly in the water. It seemed that every rock formation and cave had a name and a fun story that I heard from the water taxi driver that gave us a tour around the tip before dropping us off on the beach. I think it's better to hear them in person told by a local than reading them from me. So I hope you get to go one day (if you haven't been already). And if you go spend a few hours on Lovers' Beach and Divorce beach, beware that there is hardly any shade except right at the rocks and only if the sun is at an angle. Of course, as everywhere in Cabo, there are people selling drinks. But I'd advise to bring your own water (and beer), a hat and lots of sun screen. The song featured in this video is “Beachfront Celebration” by Kevin MacLeod (incompetech.com). It is licensed under Creative Commons: By Attribution 3.0 License. Thank you, Kevin, for your big variety of free music!